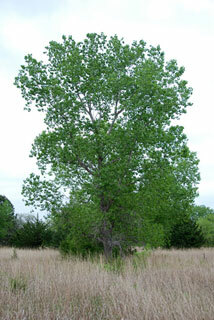 Trunks: Erect, 3-6+ feet diameter; bark gray, furrows deep, ridges wide, flat; wood light brown or tan, soft. Twigs: Olive-brown to yellowish brown or gray, brittle, glabrous; leaf scars shallowly crescent-shaped to half-round; buds tan, ovoid,.24 to 1.1 inch, apex acute. Leaves: Alternate, deciduous, broadly triangular, 1.6 to 5.6 inches long, .6 to 6 inches wide, thick, firm, glabrous; upper surface green, shiny; lower surface paler; margins toothed, teeth incurved; stalk slender, 1.2 to 3+ inches long; base flat or wedge-shaped to heart-shaped; tip long-tapering to point; leaves bright yellow in autumn. Flowers: Inflorescences axillary from wood of the previous year, catkins, pendent; staminate catkins 3.2 to 4.8 inches, many-flowered; pistillate catkins 1.2 to 2.4 inches, many-flowered. Flowers unisexual, radially symmetric; perianth a non-nectariferous saucer-shaped disk, .04 to .16 inch diam. ; staminate: stamens (30-)40-80; pistillate: pistil 1, styles 2-4; stigmas 2-4. Fruit: May to July; capsules, short-stalked, initially green, later brown, in drooping catkins 3.2 to 11 inches long; seeds light brown, about 1/6 inch long, with dense tuft of long, cottony hairs. Habitat: Stream banks, river bottoms, lake shores; moist soils, but will grow in drier situations. Uses: Native Americans used the buds, seeds, and inner bark for food and boiled the seeds to make a yellow dye for arrow feathers. Children would chew the fruit as gum, use the green, unopened fruit as beads, and would fashion toy tipis from the leaves. The leaves were also used by girls too make a flute-like instrument. The wood was used to make ceremonial poles and branches used as forage for horses. Comments: The state tree of Kansas. Cottonwood is fast growing. The limbs often break in strong winds. A lumber tree with light, soft, dark-brown wood that can warp and is difficult to season. Latin deltoides, alluding to the shape of the leaves.